I don't know about you, but I feel like my wallet opens the day after Thanksgiving and doesn't close until after New Year's. There's no doubt about it, this can be a very expensive time of the year.Besides the gifts, I find myself spending money on things like decorations, party food and clothes. It all adds up for sure. Never underestimate the power and versatility of your LBD (little black dress). For a girls lunch, pair it with tights, boots and a brightly colored scarf or cardi. For a night out, add sheer stockings, black slingbacks and your best jewelry. Office get-together? Try opaque hose and a structured jacket. Your options are limitless, and no one will realize it's the same basic underneath. One dress - three parties! I love a live wreath on my big picture window. But decorated wreaths can set you back $30 or more. Trader Joe's has plain evergreen wreaths for about $6.99. You can dress it up with some floral picks from the dollar-store, a few pine cones and a festive bow, keeping your grand total under $10. Another easy way to save money on decoration is to use what you have. Do you have green and red vases? A cluster of them can make a holiday-inspired vignette. Tie a red or gold bow on a topiary to make them more Christmas-y. Pine cones in a bowl and cranberries in a glass vase can bump up your decor for pennies. Try to shop sales whenever possible. One year I scored monogrammed Lands End tote bags for $20 (it was a daily email sale) - they made great teacher's gifts and looked festive stuffed with bright tissue paper and tied with a tulle ribbon. Or consider a $1 store mug filled with good chocolate. Add a festive tag created by your child to finish it off. With Pinterest at our disposal, it's easier than ever to get inspired. 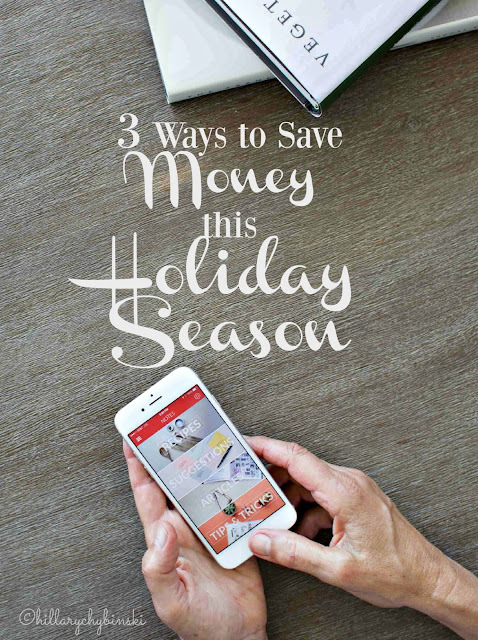 What's your favorite way to save money during the holiday season? I love to give books for gifts. Our library has a huge sale in early December so I stock up on books for my kids, nieces and nephews and a ton for my Xmas present :) pinning your post to my Christmas board. That's a GREAT idea Tanya! Thanks for sharing! I love my dollar store for decorations that look expensive. I've saved so much money by going there first before anywhere else.